At MyroPCB, we are constantly looking at ways to serve your needs better. If you have used with our PCB service, you may want to make stencil or PCB assembly for your projects. In the month of July, we will offer 20% discount off your first stencil purchase, when your stencil order(s) is over US$125 or your PCB and stencil orders are over US$250. We offer custom made laser-cut stainless steel stencils for SMT solder paste, BGA rework and other types of screens/stencils. To help answering your questions in a timely manner, we hare implemented a live online chat system. If you have a technical issue or a sales question, you can launch the chat and get immediate responses. Our sales and support staff will be available 24 hours a day and 7 days a week (excluding Canadian public holidays). When you’re chatting with our staff, don’t worry about taking notes. The transcript of the chat will be emailed to you to the provided email address as soon as the chat is completed. The live online chat is another tool which helps us serve you better. Please use it and let us know how we may improve. MyRO ERP (Enterprise Resource Planning) is our digital system which controls our entire work flow of your orders on PCB, PCBA, FPC, Stencil and components. This software system is essential to ensure our quality of service and timely delivery. The first version of MyRO ERP was launched back in 2002. Further conversation revealed that checking the price of different lead time is a pain in filling in the ordering form. We listened and removed the “Lead Time” field, and provided a table of pricing based on 1~6 days of lead time. You can simply compare and choose the lead time which is right for you. It’s also one less field to fill in. The pricing reflects the effort in completing a job in the specified lead time. Normally, we can schedule the work properly in our work queue within 6 days. However, when a large number of orders rush in in a short period, a 15 days lead time may have a better price. We’d love to hear from you about how you like or hate the system. This will help us serve your better. If you have anything to say, please comment below. 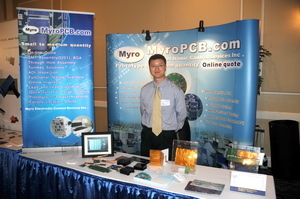 MyroPCB is to exhibit at the Canadian EpTech shows in Toronto, Montreal, Ottawa and Saskatoon. If you happen to be nearby, we would love to meet up with you. Please see the following dates and locations. Update: The Toronto and Montreal shows were great fun. It’s most exciting meeting up with our customers face to face. Here’s the photo of Bob at the Toronto show. Robert took the picture. Many people are perplexed by countersink holes (often called sink hole or countersunk hole) on PCB boards. Indeed these terms deserve a good explanation. A countersunk hole is simply a normal right cylindrical through-hole with an additional right conical section removed on the top. The cone angle is typically 82 or 100 degrees. A related term is counterbore hole which has an additional flat-bottomed hole. The following are two cross-section diagrams, courtesy of Wikipedia. On a PCB pad, countersink or counterbore holes can be plated for unplated. A common usage of countersink or counterbore holes is to allow the head of a countersunk bolt or screw, when placed in the hole, to sit flush with or below the surface of the surrounding material. Countersink/counterbore holes are commonly used for mounting to ensure the clearance is sufficient where vertical space is very tight. Plated countersink/counterbore holes are also used for chassis ground contact. In manufacturing pads with countersink/counterbore holes, special precision drilling is required. Many PCB manufacturers do not have the capability drilling countersink/counterbore holes. At MyRO, we have advanced drilling machines which can produce perfect countersink/counterbore holes to your specification. Copyright © 2002 - 2019 MyRO Electronic Control Devices Inc. All rights reserved.